I am quite sure that many of us have experienced this before – we hardly exercise, and one fine day, when a particular situation requires us to actually flex our muscles a whole lot more than normal, such as shifting house or helping a neighbor with his or her spring cleaning, the effect kicks in afterwards, when our bodies start to ache all over the place, even letting you discover the presence of muscles that you didn’t know you had in the first place. 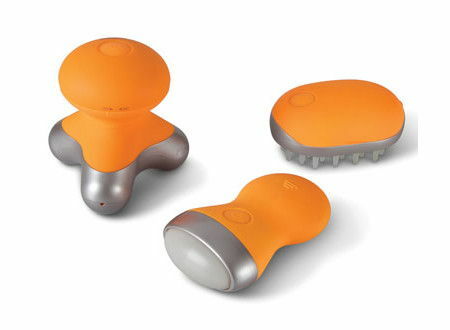 Why not soothe those aching areas with the $49.95 Targeted Body Massagers? The Targeted Body Massagers happen to arrive in a set of three vibration massagers which have been specially shaped so that it can target muscles over the entire body. These three components happen to be tailored to fit their intended treatment area, including the scalp massager’s soft bristles which helps to soothe the scalp, while the facial massager’s rollers will function to release stress under the eyes and temples, with the body massager’s trio of pivoting nodes relaxing your thighs and calves. They will feature a rubberized exterior and ergonomic design that will fit comfortably in one’s palm, and thankfully, it boasts of a waterproof construction so that you can use them even as you shower. There is no need to recharge these as they run on AAA batteries.